Do you love wine bars? I once went to this wine bar called The Living Room. It had a great lounge feel to it. There were tables, but also sofas, overstuffed chairs, coffee tables and fireplaces. It was like being in your living room, with great food and wine. $60 later, we got 3 glasses of wine, a cheese & fruit plate and some bruschetta. We hadn’t eaten dinner and still had to pay the sitter. That ended up being a $100 date night. 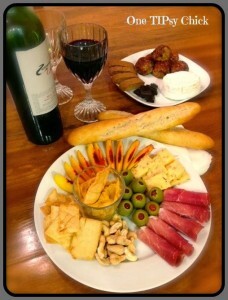 Saturday night I recreated our wine bar experience at home, only better. I got almost everything from Trader Joe’s(I love this store!) for about $30. Best part was that included a whole bottle of wine and enough food to do this again one night this week! I already had the cashews, olives, apricot preserves and chocolate. I bought everything else at Trader Joe’s. It was delicious and filling. I could tell you that the kids were asleep and that I lit candles and had good music playing in the background while we enjoyed good conversation or stared into one another’s eyes, but I’m not going to lie. The truth is the kids were in another room watching a movie. We moved this all into the family room and watched two episodes of Homeland, while the dog’s begged for food. But it didn’t matter. The point was that we spent time together, got away from our ordinary routine and didn’t have to be concerned with who would drive home! We got to relax, have a glass of wine and “dinner” was fun, different and felt special.